David Gilmour is readying The Endless River for an October release. There will be no Roger Waters on it - that's for sure. And no telling how many David Gilmour-sung songs will be on it, either. But today, Columbia Records confirmed the October release of The Endless River, the first disc of new music by Pink Floyd in 20 years. According to a press release, the album is "mainly ambient and instrumental music based on the 1993/4 Division Bell sessions which feature David Gilmour, Nick Mason and Richard Wright." 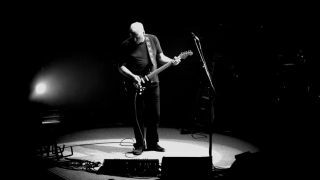 The release also added that the album will be produced by Gilmour alongside Phil Manzanera, Youth and recording engineer Andy Jackson, and that work was still in progress. Vocalist Durga McBroom-Hudson, who once toured with Pink Floyd - and who appears to be involved in the new project - then wrote on her Facebook page: "The recording did start during The Division Bell sessions (and yes, it was the side project originally titled 'The Big Spliff' that Nick Mason spoke about). Which is why there are Richard Wright tracks on it. But David and Nick have gone in and done a lot more since then. It was originally to be a completely instrumental recording, but I came in last December and sang on a few tracks. David then expanded on my backing vocals and has done a lead on at least one of them. That's the song you see being worked on in the photo."